The trolling motor of the future is here. What impressed this angler most at the ICAST show? This old angler got about an hour to wander about on the last day. What impressed me the most? A stop at the Minn Kota booth revealed Minn Kota’s new Ulterra™ Trolling Motor. Imagine the Terrova trolling motor. Now add a feature we thought we would never see. That is right, automatic stow and deploy! There is more. Push a button on the handy remote and you can trim the motor depth. The Ulterra is truly impressive! Ulterra will be available Fall 2014 with manufacturer’s suggested retail pricing between $1,989.99 and $2,549.99, and will come in 80- and 112-pound thrust models with 45- and 60-inch shafts. Ulterra will also come standard with Universal Sonar 2. Oh, yes. There were some great products in our booth. 🙂 We will get to them later. The Ulterra deploys and trims with touch of a button. 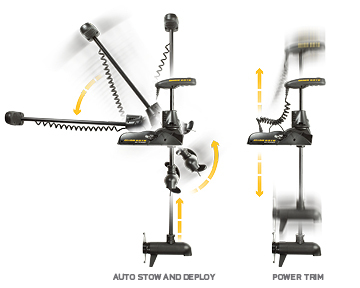 This entry was posted in Fishing and tagged Minn-Kota, trolling motor, Ulterra. Bookmark the permalink. 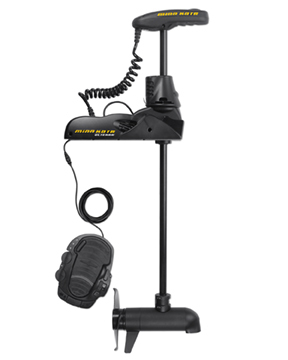 5 Responses to The trolling motor of the future is here.